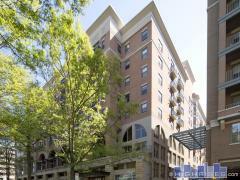 Stretching nine stories high, Bethesda’s Adagio condominium building offers sharp, sleek luxury living that puts you in the center of all the action in one of the DC Metro area’s most popular neighborhoods for shopping, dining, and having fun. Unit features include hardwood flooring, solid-wood kitchen and bathroom cabinets, stainless-steel kitchen appliances (including such iconic brands as Bosch and Sub-Zero), and floor-to-ceiling windows that let in plenty of natural sunlight. Adagio residents can also enjoy the building’s amenities, among them underground garage parking (say goodbye to hunting for parking spaces) and an in-building Washington Sports Club with a pool (say hello to convenient, more productive workouts). Plus, there’s concierge service and a 24-hour front desk. Part of what makes urban living so satisfying is the proximity to excitement—and that proximity is all yours. Within walking distance of Adagio is Landmark’s Bethesda Row Cinema, Mon Ami Gabi, Trader Joe’s, CorePower Yoga, Ruth’s Chris Steak House, Norwood Local Park, and the Chevy Chase Club. Several blocks north is the Bethesda Metro station, which serves the Red Line and can take you right into the heart of DC for even more fun times—or, yes, for work. Have any comments or questions about The Adagio? Ask your question and/or share your thoughts about this Building.